Finding the best washable bed for your dog can be a real challenge. Not only can dogs sometimes be a little picky, but you have to look after yourself as well. If the bed isn’t washable, how are you supposed to clean it. It seems like finding the perfect dog bed is becoming more and more difficult with all of the cheap replicas all over the internet. Washing most of these models ends up either ruining the bed or not even cleaning at all! Luckily, you can still find the best washable dog bed for your situation throughout this list. You won’t find any cheap, flaky models, nor any non-washable beds. Whether it’s just a washable cover, or a full-on bed that you can fold up and throw into the laundry machine, you’ll find the best options for you and your dog in the list below. Should you buy a washable cover or a fully washable bed? What is the best filling? 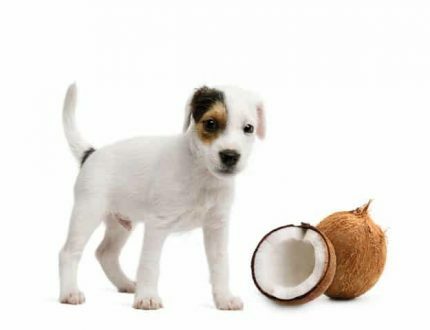 What is the best dog bed for a small dog? What is the best dog bed for a large dog? Why should you get a machine washable dog bed? Why should your dog have a bed at all? Should you get a machine washable dog bed or a hand washable dog bed? If you’re looking for a machine washable dog bed, the Deluxe Washable Dog Bed by MidWest Homes for Pets is definitely work a look. The simple design paired with easy washing instructions makes it an incredibly popular option for many pet owners. Washing this dog bed is as simple as throwing it in the washer on a cold, gentle spin without any other laundry. This bed needs its own cycle so it doesn’t twist up other clothing in the machine. Drying is as easy as throwing it on tumble dry with a low setting. Make sure you don’t add any bleach or anything that could stain and deteriorate the bed while it’s washing or drying. 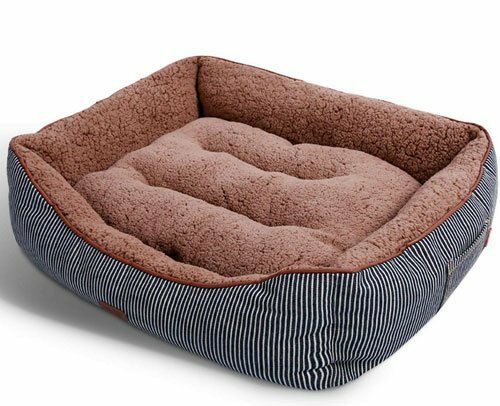 The plush feeling of the foam inside this dog bed is incredibly comfortable for dogs. It’s almost comfy enough to make you want a couple for yourself! Paired with the swirled faux fur pattern, it’s an unbeatable match that any pup couldn’t resist. 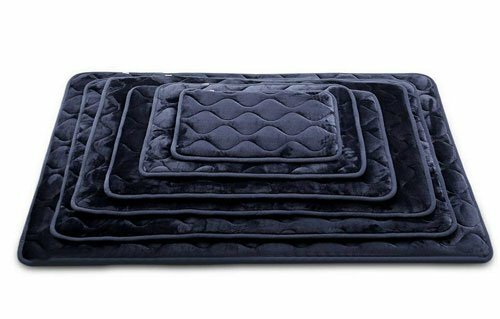 The Hero Dog bed mat is a much simpler alternative to other dog beds. It’s not very fluffy, and you won’t find much bulk and fluff all over it. Not only that, but there’s not any fur either. However, it’s a perfect option for owners looking into a low-profile, machine washable dog bed. The sleek design of this dog bed is easy to set up in almost any area of the house. It’s also great for setting up in a hotel room or family members house. The small size is great for going mobile, but it doesn’t compromise the comfort of the bed. The bottom of this machine washable dog bed has a non-slip grip material that doesn’t cause your pup to slide around. When dogs are excited, they run in super fast and accidents can happen. Luckily, the bottom of this pad won’t allow for slipping! The Milliard Premium Memory Foam Dog Bed comes with a washable cover that makes it super easy for you to keep the bed clean. While most other dog beds these days come with a solid single piece that can’t be washed by machine, it’s nice to have an easy-to-clean cover. 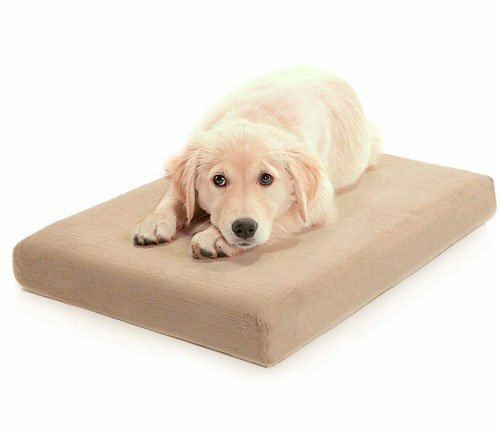 Milliard is well-known for producing comfortable mattresses for us humans, and the quality doesn’t fade when it comes to their memory foam dog beds. The dense foam used in their products is perfect for supporting your dog’s muscles and joints. The covers on these mattresses is very easy to wash. All you have to do is throw it in with the rest of your laundry and dry it the same way. Once you’re done, immediately put the cover back onto the bed to avoid wrinkling. Some dogs need to live in luxury! If that sounds like your pup, then you should check out the FurHaven Pet Dog Bed. It’s a memory foam sofa with arms on both sides for your dog to rest their heads. To wash this dog bed cover, all you have to do is remove the memory foam core and follow the simple instructions. Once you’ve removed the memory foam, zip up the cover and throw it in by itself through a cold cycle. Hang dry it, or set your dryer on low tumble. With all of the color and size options provided for this dog bed, you’ll have no problem finding the perfect combination to suit your dog’s needs. Choose from colors like Deep Pool, Espresso, and Stone Gray, and sizes from small to jumbo plus. It’s always a good choice to get one size larger than you might think, unless you know from previous purchases! Sometimes it can be hard to train your puppy to sleep in their bed. Luckily, these machine washable dog beds from Best Friends by Sheri are made with fur that’s supposed to mimic a mother dog’s fur. Instead of looking for warmth all over the house, they’ll focus on their beds! The shape of these donut beds is in the name. It’s a fluffy circle that allows your dog to sink right into the middle. This shape does an excellent job at both supporting the joints and muscles of your dog, as well as providing a protective feeling from all sides. 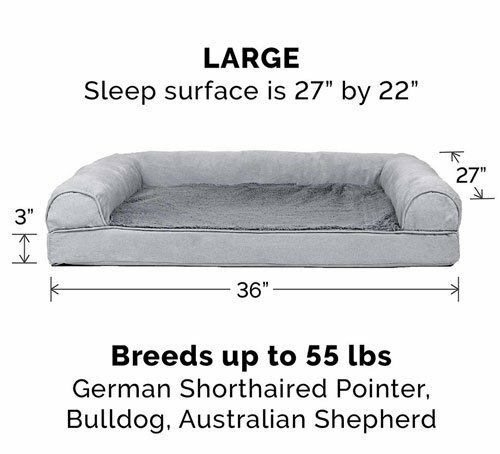 Depending on how big your dog is, you might want to check out the various different sizes. The goal of these donut beds is to provide a protective and comfortable outer edge, which means the bed should be bigger than your dog unlike most other dog mattresses. 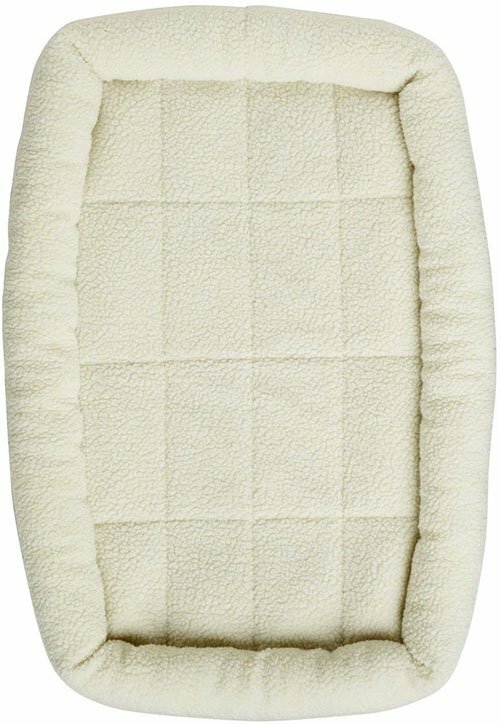 The AmazonBasics Padded dog bed is probably the simplest designed bed on the list. There’s nothing fancy about it, but you’ll find that it’s incredibly useful for your pup. Although it’s not very decorative, it still gets the job done and keeps your pup comfortable. If you’re trying to find a machine washable dog bed that’s easy to take from place to place and won’t take up much space in your home, this might be the best bet for you. The arms on the side of the bed ensure that your dog can rest with their head propped up while lounging all day long. In order to clean this dog bed, you don’t need to do anything more than wash it like any other article of clothing. Throw the mattress in on its own cycle, and then hang dry or low tumble dry it. The only downside is that it needs to have its own cycle, and can’t be loaded with anything else. The style is in the name for this dog bed… ‘Premium’! This dog bed is one of the best washable dog beds on the market. 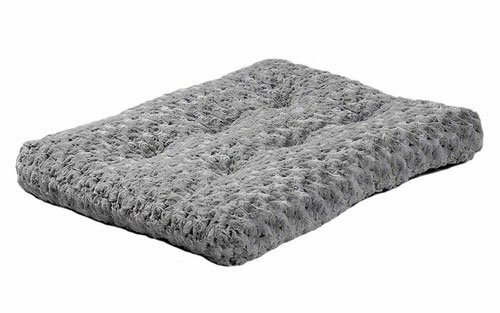 It has a fluffy, supportive base with arms on 75% of the bed’s edge to keep your dog’s neck propped up. Most machine washable dog beds aren’t nearly as puffy as this one. With so much filling and excess foam, many of the competing mattresses fall short. However, the Smiling Paws washable dog bed allows you to throw it in the laundry and rest assured that it won’t mess up! It’s important to note the problems that can occur if you buy a cheaply made dog bed. If the foam isn’t dense enough, your dog ends up having the same support as the floor below it! Luckily, this mattress is made to support and elevate your dog off the ground. Paired with a non-slip bottom, it’s hard to beat this one! Dogs love having loads of fun! Everything they do is playful for the most part, so why not incorporate that aspect into their bedding? 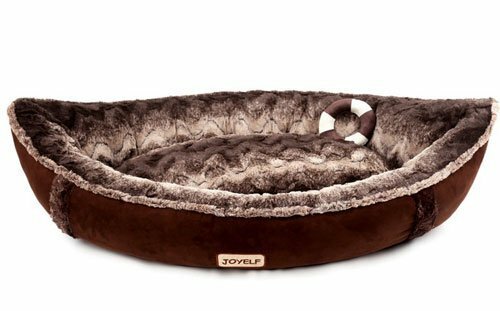 The JOYELF dog bed is shaped liked a boat to keep their sleeping adventurous as ever! Unlike many of the other beds that you have to wash by hand, this one comes with a removable cover that you can just zip up and throw in the laundry machine. Throw it in with the rest of the clothes, just don’t forget to use a lint roller on it first! The materials used in this bed are made to not rip along stitch lines, which means you don’t have to worry about it tearing apart in the future. Especially if you’re going to be machine washing it, you want to ensure that the materials are well-constructed. While the decision is ultimately up to you, there are a few things to consider before you go buying the first washable dog bed that you find. For example, many of the beds aren’t meant for certain washing machines. You want to make sure that you have a large enough laundry setup prior to purchasing a larger washable dog bed. If your pup is large but the washer is small, it’s probably a good idea to get a bed that has a removable and washable cover. However, if you notice that your washing machine is more than equipped to wash a large dog bed, this is definitely the more popular option. Why? Because everyone loves to just throw the bed in and not worry about it until it’s dry! Not only that, but being able to wash the whole bed means that you’re deep cleaning the entire unit. With a washable cover, you still have to clean the interior by hand. Although it’s not too tasking, it takes a bit more time. While many dog beds claim to be machine washable, you’ll start to notice that some of the cheaper ones get messed up after a few cycles. Whether they’re made with cheap material, or something that shouldn’t be washed despite the advertising, certain beds simply can’t be washed. Some examples of these bad filling include loose or chopped up memory foam, beads, sand, cotton fluff, and so on. If you choose to go with one of these materials, you’re better off washing the cover instead of the whole bed. Dense memory foam is usually the best washable dog bed filling, since it doesn’t get easily deteriorated. Unlike loose foam, this alternative holds its shape very well without hanging onto water from the laundry cycle. Sand and beads are bad not just because of the possibility of them ripping open and filling your washer or dryer with the contents, but also because they absorb so much water. This causes the bed to triple or quadruple in weight until it dries out, which could be quite some time. Water mixed with darkness in a confined area usually ends up causing mold and bacterial growth in and around the dog bed! 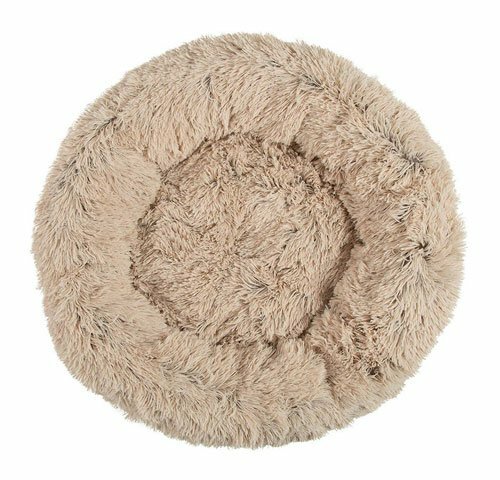 If you’re having trouble finding the right dog bed for your puppy or small dog, the Best Friends by Sheri Luxury Shag Faux Fur Donut Cuddler is a great option. It allows your dog to feel comforted by what feels like dog fur. Bringing home a new puppy can be fun for you, but frightening for them. In order to smooth the transition, these donut beds are worth the investment. They’ll feel protected and comfortable while slowly understanding that you’re the new provider in their life! The FurHaven Pet Dog Bed would have to be a close runner up, simply due to all of the size and color options. While the standard size isn’t too small, you can select whatever works for your dog. Not to mention the fact that you can also choose their favorite color! The Smiling Paws Pets Premium Dog Bed is definitely the best bed for a larger dog for multiple reasons. Its large overall size fits most dogs, small ones included. If you have multiple small dogs, you might also consider this option. Another reason that this machine washable dog bed is perfect for larger dogs is that it’s very dense. The density of memory foam affects the way your dog feels just as much as it does in your own mattress! If the foam is too loose, or not dense enough, it ends up smashing down over time. This basically results in no structural support, which can damage your dog’s joints and muscles. Large dogs are especially susceptible to joint and muscle issues, so a dense memory foam bed like this one is key to comfort and longevity. Machine washable dog beds are usually the best option for any pet owner that has access to a laundry room. 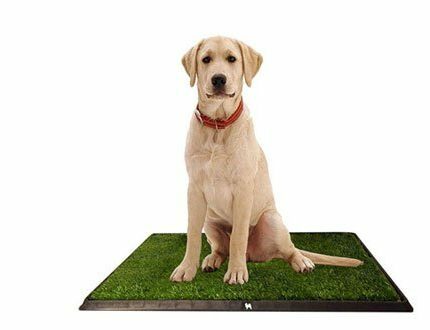 Not having to go through the pain of scrubbing down every square inch of a dog mat is very convenient and it prevents back pain on your part! When machine washable dog beds first came out, they wound up causing problems for you, your dog, and your washing machine. They cost you extra money because they break apart and you have to buy more! Your dog will slowly notice the fact that the foam was breaking down, which lead to pain and discomfort. Overall, these beds were not the best when they first came out. However, these days it’s a different story. Denser foams and durable materials are making it much easier for you to wash your dog’s bed without having to worry about ruining its structure. The foam airs out through the dryer, and some even air out by hang drying. The whole experience is meant to make your life much easier, and it keeps your dog’s napping space as clean as can be. After all, laundry machines definitely clean much deeper than hand-scrubbing! All dogs should have their own bed for a multitude of reasons. They shouldn’t have to settle for whatever works for you, because all mattresses feel different to everyone (dogs included). Your favorite density could compact their joints and cause severe arthritis over a long period of time. Not only that, but dogs need their own place to sleep. Most pet owners love having their dog cuddle up in bed with them, but even your dog likes its own comfortable space every now and then. Plus, having a dog bed gives them a sense of pride and ownership. 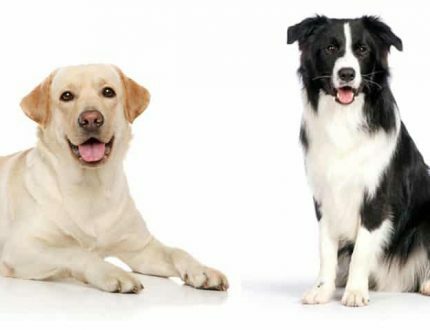 When dogs get older, they have bone, muscle, organ, and joint problems. Sadly, so many pet owners don’t focus on the root cause, so mistakes are made time and time again. A proper dog bed plays a key role in preventing most if not all of the aforementioned health problems. The basic principle of convenience would naturally tell us that machine washable dog beds are always the right way to go. Without having to scrub those trouble spots all around the mat, you save yourself a whole lot of time and energy. The only time that a dog owner should consider hand washable dog beds is obviously when they don’t have access to laundry facilities. Other than that, there aren’t any other benefits to hand washing a dog bed! Save yourself the struggle and invest in a dense memory foam mattress, or get a washable cover at the very least. You can also increase the overall life span of any dog bed by scrubbing it down with non-toxic soap and warm water occasionally. This prevents excessive yet natural wear and tear from washing cycles, while maintaining the overall integrity of the product. In the end, you should always focus on the person (or pet) that you’re shopping for. They should have a supportive, comfortable, and relaxing dog bed. For your own sake, try to make sure that it’s machine washable!